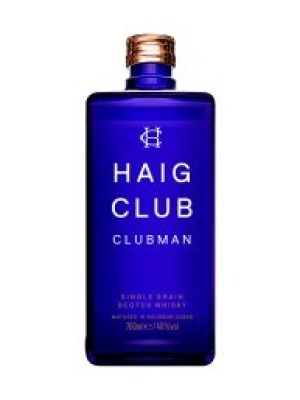 Haig Club Clubman Whisky is a popular Whisky available from Tesco Groceries in 70cl to buy online. Visit Tesco Groceries for the best price for 70cl of Haig Club Clubman Whisky or compare prices on our other Whisky products. Haig Club Clubman is a modern and stylish Single Grain Scotch Whisky developed in partnership between Diageo and global icon David Beckham and British entrepreneur Simon Fuller. Distilled at Cameronbridge Distillery, founded in 1824 by John Haig, Haig Club Clubman is matured exclusively in Fresh Bourbon Casks which give a layer of wonderful sweet, vanilla and coconut flavour to the Scotch. This combines perfectly when mixed with the sweet caramel of cola, creating an enjoyable drink which is refreshing in taste and perfect in its simplicity. In addition to being lighter and more subtle in flavour, Clubman also mixes very well indeed, sitting in perfect harmony with other cocktail ingredients. Try Haig Club Clubman and cola for a delicious, long mixed drink. Where to buy Haig Club Clubman Whisky ? Haig Club Clubman Whisky Supermarkets & Stockists. You can buy Haig Club Clubman Whisky online in most retailers and find it in the Whisky aisle in supermarkets but we found the best deals online for Haig Club Clubman Whisky in Tesco Groceries, 31dover.com, and others. Compare the current price of Haig Club Clubman Whisky in 70cl size in the table of offers below. Simply click on the button to order Haig Club Clubman Whisky online now.